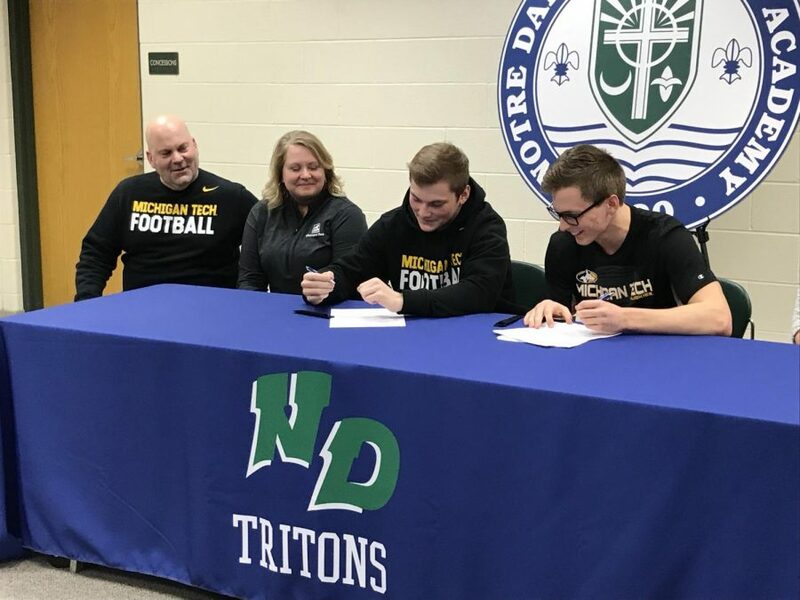 Two first-team, all-conference football players, seniors Mitch Chosa and Josh Cribben, recently signed their letter of intent to continue playing the sport they love at Michigan Tech University. Both seniors had an outstanding career at Notre Dame Academy. It is obvious how much they love to play football. Chosa chose Michigan Tech due to its prestigious reputation for academics as well as having very good athletics. Chosa intends to major in wildlife ecology, the same major that Mr. Winkler studied there. As of right now he not sure who his roommate is. Cribben is rooming with his lifelong friend. Chosa hopes to be connected with another incoming football player. “I am most excited for being on my own and pursuing the major I have wanted to study since I was little,” Chosa said. “The love for the sport made me want to continue playing. Football just gets in your blood, and it’s a sport you don’t want to let go. I just couldn’t let it go. You won’t be able to play forever so why not play it while you can,” Chosa added. Cribben was the first one to decide on attending Michigan Tech first with Chosa being recruited shortly after. They both didn’t really know they would be on the team together until after Chosa’s visit. “Josh and I have always had a good relationship and get along well, so I think we are both excited that we get to play together. I don’t think that our playing together played into the decision too much. It was not like we were a package deal or anything. I think that it is just a really fortunate coincidence. Tech is a great school so it would be dumb on both our parts to not go there and play the sport we love,” Chosa said. Cribben chose Michigan Tech because it was the only scholarship offer he had, and it is a great engineering school. He intends to major in electrical engineering. Cribben plans to room with his buddy from West De Pere, a grade school friend. “I love the sport of football and any opportunity to continue playing I would like to take. Also the fact that I got a scholarship to play is a big help to my making this decision,” said Cribben. Cribben is excited to play football at a higher level with even better competition and also to further his own education at a great college. “I did not know that Mitch was going to be going there when I committed, but knowing that he is now I am a lot more excited to get up there. Having someone else that I have played football with and know already is awesome and I’m glad to continue my journey with him,” Cribben said.